If you’re planning to add a new member to your electric guitar family this year, here are nine hyped-up models that we think will make the cut. Gibson’s return to NAMM in 2019 was a huge statement of intent for the company’s new regime, revealing a wealth of exciting vintage-inspired models. Our pick of the bunch was a celebration of Gibson’s most iconic guitar: the 60th Anniversary 1959 Les Paul Standard. Emphasising Gibson’s renewed emphasis on vintage accuracy, the 60th Anniversary ’59 Les Paul is built using laser-scanned dimensions from original guitars, plus chemically recreated plastics and colour-matched shades of sunburst. Gibson claims it’s the culmination of 20 years’ study of the original Burst by Gibson Custom, and we can’t wait to get our hands on one for a proper play-test. One of the most talked about guitars of recent months, Fender and Jimmy Page’s team-up to recreate the legendary guitarist’s famed 1959 Telecaster was finally on show at NAMM. The guitar was Page’s main axe on the Led Zeppelin I album, and is best remembered for being played with a violin bow during a 1969 live rendition of Dazed And Confused. Ibanez’s venerable RG line has been bolstered by some new Japan-made Prestige 5000 models for 2019, and the RG5120M is perhaps the most interesting new addition. The Frozen Ocean Blue shred machine features an African mahogany body with an ash top, and a Super Wizard HP neck that’s built from a five-piece maple and wenge combination, which also has a 17-inch-radius bound birdseye-maple fretboard adorned with offset mother-of-pearl dot inlays. Most interesting, however, is the inclusion of Fishman’s Fluence active humbuckers as standard. Epiphone has delved into its history to design the new-for-2019 DC PRO, which is inspired by the brand’s 70s-era Del Rey Double Cut, this time pairing modern features with premium cosmetics. The guitar’s mahogany body is capped with a AAA flame-maple veneer top, while the neck is also mahogany, featuring a custom C-shape with a 12-inch-radius pau ferro fretboard and classy pearloid-and-abalone inlays. Pickup-wise, there’s a pair of Epiphone ProBuckers with coil-splits and a treble-bleed circuit that maintains tonal clarity even at lower volumes. Eastman’s new T484 semi-hollow model has been pegged as a “Swiss army knife” of tones, thanks to its versatile Seymour Duncan pickup combo: a ’59 at the bridge, and a Jazz at the neck. In terms of build, the guitar features a 14-inch body, a shiny laminate and a centre-block construction. Additionally, the T484 sports a slimmer headstock design touted to provide a better balance across the instrument. The various iterations of Paul’s Guitar have been the instrument that showcases Paul Reed Smith’s most cutting-edge discoveries relating to great electric-guitar tone. By adding that to the company’s more affordable SE range, Smith is bringing some of that learning to a wider audience than ever. With TCI ‘S’ Treble and Bass pickups delivering pure vintage tone, the mini-toggle switches allow true single-coil operation of both pickups for maximum versatility. The guitar is also available in three classic PRS shades – Amber, Aqua and Fire Red. Gretsch celebrated the 15-year anniversary of its fabled Custom Shop during NAMM 2019, and expanded its Players Edition with a range of new models and finishes. Resplendent in its new Round-Up Orange finish, the G6620T Players Edition Nashville Center Block Double-Cut with String-Thru Bigsby teams a maple top, body and headstock construction with a 22-fret ebony fingerboard sporting Neo-Classic thumbnail inlays, and a pair of High Sensitive Filter’Tron pickups. You’ll also find a mean-looking Black Falcon and a Silver Sparkle G6229 Jet BT elsewhere in the range. This affordable signature model for the Canadian guitar virtuoso stands out among the pointy fare in Schecter’s 2019 range. The Indonesian-made S-type offers all the functionality and playability that any technician would desire, but with classic looks. Sporting the classic combo of alder, maple and rosewood in the wood department, the guitar features a trio of the online fret-blazer’s signature single coils and is available in either Atomic Green or Atomic Silver. 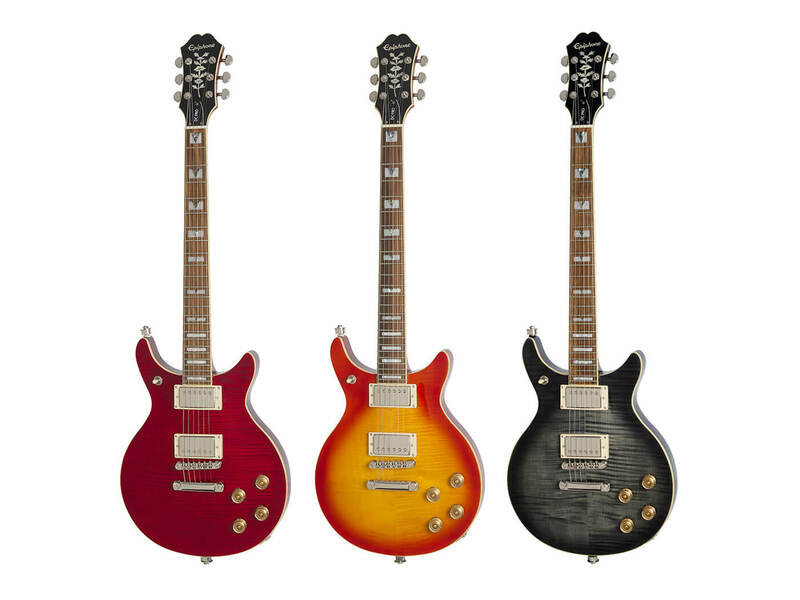 The reborn Harmony Guitars revealed a trio of modern takes on the company’s classic models last year, and after a year of further R&D, the new standard line will be available in March this year. Also new for 2019 is the Juno – a reimagined take on the H44 body shape – and fans of old-school Harmonys will be delighted by a new range of vintage-faithful resissues, starting with the H19, H72 and H63. Read our picks of the most anticipated acoustic guitars here.